On August 26, 1956, a routine training flight from the Sand Point Naval Air station went awry when the flight crew missed setting their flaps and the PB4Y Navy Bomber they were flying crashed shortly after takeoff into Lake Washington. The WWII bomber, a Navy version of the venerable B-24, sank in 175 feet of water, after all crew were safely evacuated to life rafts. Salvagers eventually managed to get the plane back to the surface, where a shackle pin broke and the plane sank back into the depths of Lake Washington and all further salvage efforts were abandoned. The official Navy accident report lists the final position of the plane in 210’ of water, a forgotten bit of history lying undisturbed in the cold darks waters of the lake. When the plane was rediscovered by divers, it was found to be remarkably well preserved, lying on the muddy bottom in 155’ of water, not far from the boat ramp at Seattle’s Magnuson Park. I was fortunate to be able to dive the PB4Y-2 Privateer on a bright sunny day, with calm waters. We had dropped the shot-line about 10’ from the aircraft, but the first two dive teams had descended to the bottom, and were unable to locate the plane. Visibility at the bottom of the lake generally runs about 5 – 10’, and the lack of contrast between the murky brown water and the muddy bottom actually caused both of the previous teams to “crash” into the mud on descent. Both teams humorously described their descent as watching their depth gauges go, “ 120’, 130’, oops, where did the lights go”, as they were enveloped by clouds of soft mud from the bottom. When it was our turn, I found the descent dark and disorienting, with no visual reference other than our down line. I stopped at 130’, to make sure I was perfectly neutral, and then exhaled to descend slowly. 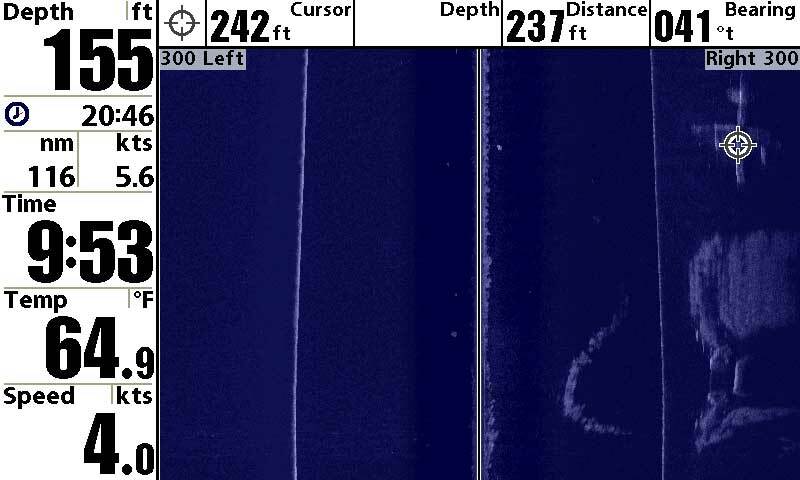 At a depth of about 150', I observed the white down line simply vanishing and realized I was at the bottom, and the shot was down into the mud, but it was nearly impossible to actually see the bottom. Attaching a reel to the line, we swam north toward the plane. Ten feet, twenty feet, thirty feet, hmmmm, we should have seen it by now. I felt something brush my fin tip, and turned to check, but couldn’t see anything, so continued another ten feet, feeling something brush my fin again. I turned to look, shining my HID light back, and saw nothing, so turned to go forward, and ran smack right into the side turret of the plane! Wow, we’re here! 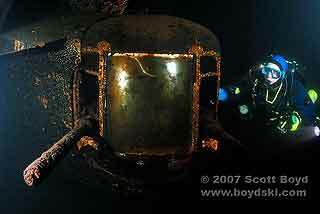 Once the reel was attached, we swam up over the top of the wreck, where it was easier to orient yourself. 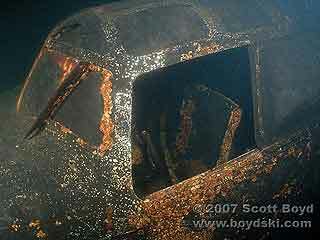 We then swam forward to peer in through the escape hatches (used by the 11 man crew of the plane to escape as it sank) and into the cockpit, wheels still in place (and flap controls still in the wrong position). At the very front of the plane, the .50 caliber machine guns still point off into the murky waters, protecting the plane from imagined enemies in the gloom. The wings are still in place (110’ wing span), and the starboard landing gear is down and is still helping to support the 45,000 lbs. plane off the bottom. The outer engines are still in place, with propellers that look as though they are ready to take off on another flight. The machine guns are still in place in the tail turret, and are pointing down into the mud, and it was here that the dive story became very entertaining. As I descended down the rudder towards the tail turret, I spotted the line from our reel, running just below tail of the aircraft. It was heading off to the South, and with two fin kicks, I could actually see the shot line heading back to the surface, a mere ten feet away. I showed my dive buddy the line, and we both began to laugh. Apparently, we had swum right underneath the plane, below the port stabilizer and along the body of the aircraft for about 30’ before I ran into the side turret. Even though sweeping from side to side and up and down with my light, we had missed the plane that was so close, I had actually brushed it with my fins twice. Did I tell you that it was MURKY, and DARK down there! After a good laugh, we recovered the reel and began our slow ascent back into the world of sunlight and warmth. Water temperature at the bottom of the lake was about 45 degrees (about three degrees colder than my recent dives in Puget Sound), and visibility is very, very low. However, the lake is littered with historical wrecks, so I’ll be back, prepared for the more difficult diving conditions encountered there but feeling privileged to be able to view such well preserved history. 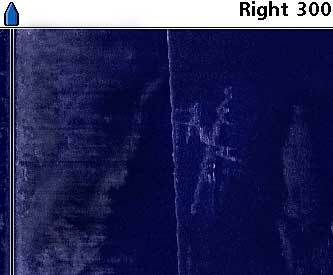 For our second visit to the site, we launched the boat from Magnuson Park (the old Sand Point Naval Air Station) and found the old Navy Bomber about 0.4 miles directly off of the boat ramp (side scan sonar makes it easy). We dropped the shot line in and geared up in the rather warm sunshine. I was actually looking forward to some nice cold lake water after roasting for a bit in my drysuit. Can you say, “well done”? Viz was easily 20-25', and we spent a nice 23 minutes exploring the plane and taking pictures. The aircraft is massive and is in extremely good condition (see the May, 2006 issue for details). It always amazes me how well preserved the fresh water wrecks are when compared with those in Puget Sound. Deco was also extremely pleasant, with a nice thermocline at 20' where the water temp jumped from the mid-40's to 60 degrees. 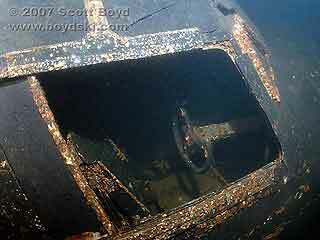 For more images of this stunning wreck, please see our PB4Y Privateer Photo Gallery! 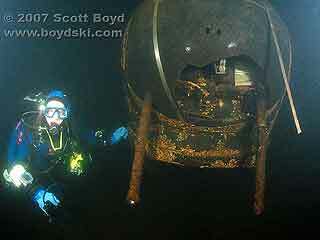 The location and dive information for this wreck can be found in Northwest Wreck Dives.